BRATISLAVA, Slovakia – World Jewish Congress CEO and Executive Vice President Robert Singer on Tuesday addressed the Conference on Combating Antisemitism in the OSCE Region in Slovakia, which brought together political leaders, government representatives, and stakeholders in academia, civil society organizations, and the media, for a forum of facilitated discussions about challenges and good practices in addressing antisemitism. Antisemites have found the internet to be an effective way of spreading their hate to an unimaginable number of people, Singer said, but noted that this serious threat pales in comparison to the threat Jewish communities around the world face to their physical security – in Bulgaria, Belgium, Denmark, and the United States, to name just a few recent examples. “We must find new ways to reach young people, whatever their nationality or religion, so they will be able to learn the lessons of history’s greatest tragedy,” Singer said, pointing to further statistics released last month by the Holocaust Memorial Day Trust, which found that 1 in 20 Britons does not believe that the Holocaust happened and 12 percent think the scale of the genocide was inflated. “To its great credit, the OSCE has been in the forefront of the struggle against antisemitism. 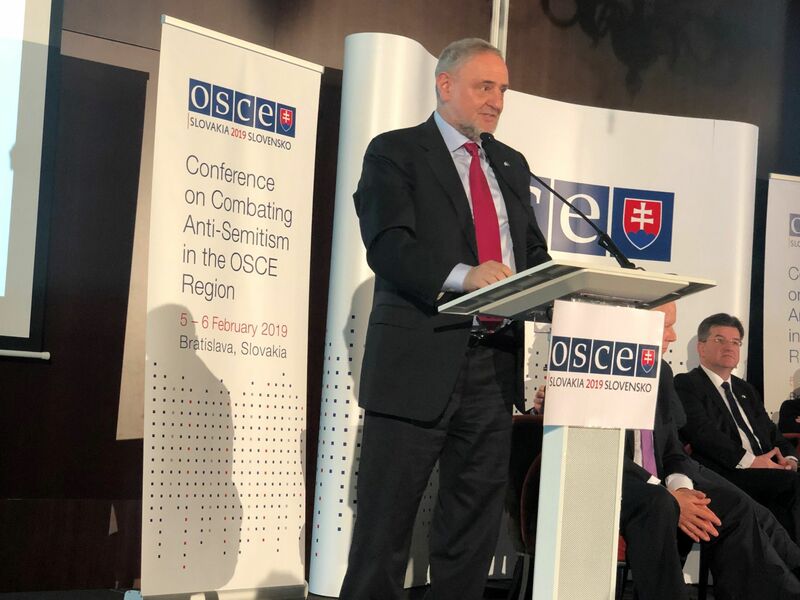 ODIHR has been tasked by the OSCE with collecting information about, and reporting on, anti-Semitic incidents and hate crimes across the OSCE region and it has done an excellent job of recording and reporting anti-Semitic incidents,” Singer said. "We are grateful for these efforts. Now is the time for action. If we speak out together with one voice, we will prevail." The two-day Organization for Security and Cooperation in Europe conference, 5-6 February, brought together some of the leading figures in the world engaged in the fight against antisemitism. In addition to Singer, notable participants included Thomas Greminger, Secretary General of the OSCE; Personal Representative of the Chairperson-in-Office on Combating Antisemitism, Rabbi Andrew Baker; Head of the Tolerance and Non-Discrimination Department of the ODIHR, Cristina Finch; Minister of Justice of the Slovak Republic, Gábor Gál; and Federal Government Commissioner for Jewish Life in Germany and the Fight Against Antisemitism, Felix Klein, among others. This was the first conference of the Slovak OSCE Chairmanship and was opened by OSCE Chairperson-in-Office Minister of Foreign and European Affairs of Slovakia Miroslav Lajčák.